As you may recall, Neil Young showed his support of Vinyl & Independent Record Stores back in 2011, on International Record Day. Now comes word that Neil Young’s Decade album -- long out of print -- will be re-released on Record Store Day, April 22. This will be a 3-LP, Black Vinyl Set and limited to 5,000 copies. The remastered release will also contain two Henry Diltz photo reproductions. "I can't remember the first Neil Young song I ever heard, but I remember the first album I owned: Decade. I had that, and then Live Rust. My earliest memories of these albums are of sleepy days inside, getting high, sitting in my room next to the turntable. I'd stare transfixed into the blurry, psychedelic photos of Live Rust, and look for deeper meaning in the handwritten notes of Decade's foldout. I loved music--Yes, Led Zeppelin, Pink Floyd--but Neil Young was closer down to earth. I'd lose myself in these albums--in the 'burned out basement' of "After the Gold Rush," in the sentimental themes of "I Am a Child" and "Sugar Mountain." The guitar solos from "Cortez the Killer" and "Down by the River" were drawn out and hypnotic and seeped into my pores like a narcotic that has never left my system." More on Neil Young's influences on other artists. Also, see REVIEW: Decade - Neil Young Albums In Order. Back in the day I recall being amazed by the quality of the unreleased songs - the last four on this list stunning and comparing this with the dearth of unreleased songs from archives- just a view. Last years Richard Linklater's 'Everybody Wants Some' there is a poignant moment involving the main character and Decade.Great moment for me because that was my '70's soundscape. I was 16 when I first bought Decade in the winter of 1986. My teenage years weren't all that fun, I was a lonely, awkward, frazzled teenager. After listening nonstop to Decade during that cold, New England winter.......I thought I discovered my new best friend. That album will always hold a special place in my heart. And of those songs, only 4 are not featured on the companion-piece to the ORS, Archives Vol 1 (though a couple feature different mixes). Decade is a nice enough record of great songs, but we already have most of them in perfectly good quality. A few of the unreleased albums that fill in the gaps wouldn't go amiss; that would be something genuinely exciting. Flyingscotzman agreed - it has a great cover and it's the only time Neil provided any sleeve notes of note. Always loved the way this was put together. Hits and collectorama. And what a great song the first one on the list is, Down to the Wire - "Take the time to close your eyes and look around..."
Decade was way ahead of its time ... what an epic record ... so many incredible spins during my younger years, probably hundreds or more ... thank you Neil! ORS is the Original Release Series, rereleasing the original albums on vinyl and CD in volumes. Yes good point. I figured I'd be in on this set for the vinyl version, to slip in with my ORS vinyl collection. I don't believe Archives was released on vinyl, but indeed the digital versions are top shelf too. AV2 should cover me for digital versions...one day maybe. This Decade release will be a minor joy in the world of Neil, but a joy nonetheless. Of course nothing compared to the joy I would feel if they ever announced the Original Unreleased Series Vol 1-4 box set. How long since Neil mentioned that would come out? Now seems like a good time to ask a question I've always had! 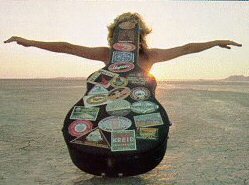 Who is in the cover photo with the guitar? I can't wait to purchase this. 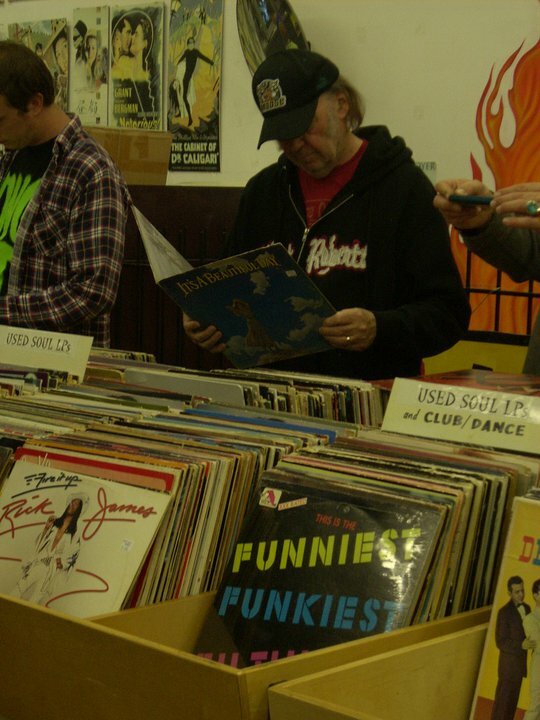 I wonder if Neil Young bought the Rick James LP in the picture. The Mynah Birds Rule. The hoodie Neil is wearing in that pic looks a lot like the hoodie I bought at one of his concerts with the name Neil Young across the front. I wonder if Neil is wearing the same hoodie with the words Elliot Roberts across the front? My "Decade" vinyls are in good shape although the cover is in several parts due to wear and tear and oddly 1 vinyl of the 3 has an orange Reprise sticker label. "It won't be long, it won't be long..."
April 22nd is my birthday and the big March for Science literacy, too! Thanks Neil! I hope to see you at the march! If you can't make it to DC, there's one in a city near you. @John Tewks, a girlfriend of Tom Wilkes -- one of Neil's employees. I'm sure she has a name & a story. Not sure if you already knew this, but, Tom Wilkes was well known for his album cover designs, packaging, graphics, etc. There is a website of Wilkes's stuff, including other shots, of the same girl, from different angles not used on "Decade." Thrasher has covered this in the past. Finally got to listen to record 3 of my RSD copy of Decade. Side 5 is actually side six. So is side six. Anybody else have the same problem or is yours correct? b. The Needle and the Damage Done was oringally a live cut with a hard cut into Tonight's The Night, on the CD it is inexplicably faded, really destroying what was a kind of a dramatic moment. Anyone know if these are fixed for the rerelease?